Away from all the bustle of everyday life, relax in the beautiful glassed in porch overlooking the straits of Mackinaw. Take a ferry ride from Cheboygan to Bois Blanc Island and spend time relaxing in the woods, hiking, biking, swimming, canoeing, and feeding the deer right in front of the house. The house is fully furnished, with a wood burning fireplace, luxury bath, and modern kitchen. Bring your car and take in the Island sites. ATTENTION PILOTS: There is a hanger available to rent when you land at the newly constructed airport. House is close to all upper Michigan attractions including Mackinaw and Drummond Island. Restaurant only a bike ride away. Rent by the week or long weekend. The full bathroom features a larger soaking tub for a relaxing bath. Cottage is on Bois Blanc Island across from Cheboygan, Mi. Freighters go by out front many times every day. What a sight to see while sitting in the sunroom or on the 16X24 deck down by the water!! Cottage sits on Lake Huron. Many boats of all sizes go by every day. Houses dotting the shoreline can be seen across the way about 5 miles away. Bald Eagles are often seen gliding along the shore. Electric & gas in sunroom. Complete with everything you need. All electric. This secluded lakefront beautifully furnished cabin is on the Straits of Mackinaw. Bois Blanc Island just off the east end of Mackinaw Island provides a perfect vacation spot. The cabin features a 16' glassed in porch, a modern kitchen and a fireplace. The 2 story cabin has sleeping accommodations for 10 people. 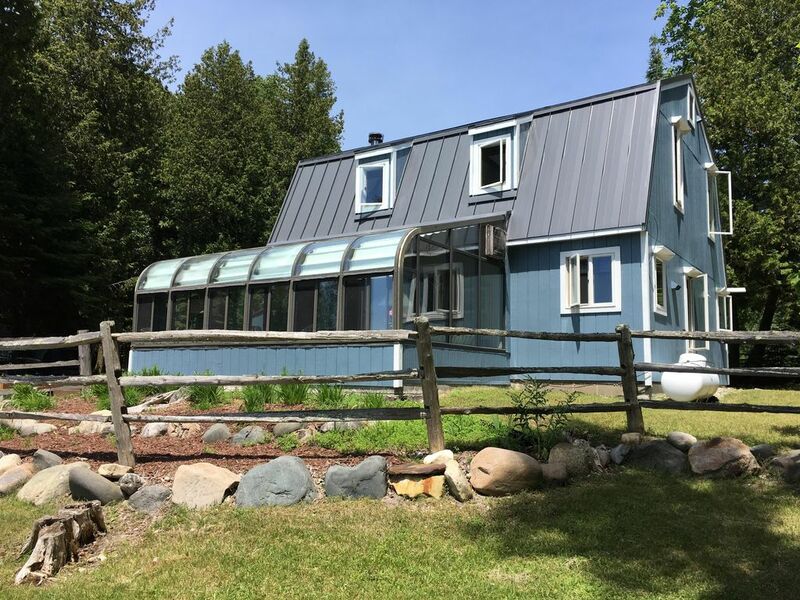 If you enjoy nature, feeding the deer off the deck, watching freighters silently slip by or hike the many trails, swim, snorkel or canoe, 4 wheeling, biking or just soaking up the sun, this is the place for you. The ferry leaves Cheboygan and accommodates your car for convenience. A small restaurant is only minutes away. ATTENTION PILOTS: If you want to fly in, a hanger is available at the newly paved 3500' runway, with transportation from the airport. .Steven is very accomadating & helps meet your special needs. Love the boardwalk down to the water. We did not use the gas grill but rather the fire pit on the beach. Nice. If you don't like deer, don't come here. They actually beg ! Will stare at you until you feed them. Nice location - quiet, calming, & able to walk or ride bike to the Pines. Owners were great, very responsive and the house was great. Hope to stay here again. This was our third time staying here. Each visit there is something new provided for our entertainment. There are kayaks and bikes to use. Paths to hike, drives to take, simply enjoy life away from the every day distractions. Our children and their families visited this time with us. They instantly fell in love with the home and island. As always, the rental is very clean and well kept. We will definitely be back. Thanks for the great review, glad you love it, we do to! Come again soon! It was a joy to stay at this cottage. The cottage is well kept with all the amenities as described. It was exactly what we were looking for and enjoyed the ability to get away from the world for a week. We plan on visiting again as soon as we can! Thank you sooooo much for sharing your cottage with us. You cannot beat the views or the wildlife! The view will take your breath away, but that is just the beginning. The deer are plentiful and if you are patient will come up to you. The home & property are gorgeous, well maintained and you are made to feel welcome and comfortable. The owners are very helpful and thoughtful about their guests experience. You really have to see it to appreciate it! If you want to get away from it all, this is the place. Would do it again in a heartbeat and am recommending it to my friends and family. I have been coming to this island since I was a little girl as my dad inherited a little piece of property! My Family rented this cottage for five days and let me tell you it looks like something off of a post card! My sister got engaged right on the shoreline of this property! Every morning I sat down by the water and had my coffee, watched the deer as they came right into the yard, kayaked Lake Huron, layed out in the sun, took the bikes out, and grilled on the grill on the porch! The view brings tears to your eyes and takes your breath away, this place is a prime example of the beauty of Michigan! The owners seem like great people and keep up on the cottage well! I loved the local dog that would wander the property (so precious and friendly)! What a beautiful part of the island! I would recommend this place 100 times over and over!